One of the world’s most popular USB mics with custom recording software and more. The Yeti Studio all-in-one professional vocal recording system gives you the tools to record with stunning quality and ease. Create like a pro using Yeti, the world's most popular USB mic, together with custom recording software from PreSonus and advanced studio vocal effects from iZotope. Start recording quickly with custom Yeti Studio templates for voice-overs, podcasts and music. Using Yeti Studio means more productivity, more creativity, and more professional-level content. You don't need to be a famous producer to create studio-quality recordings. 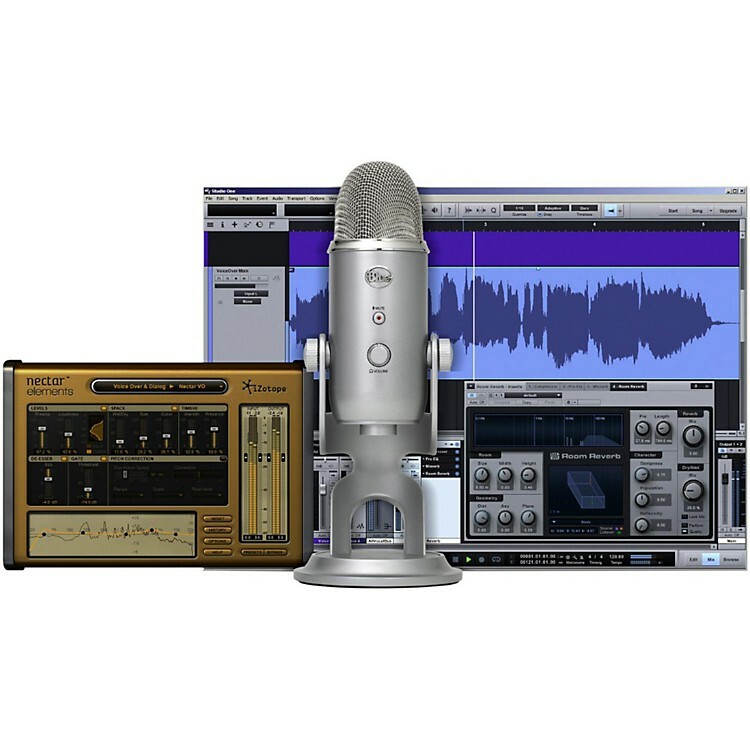 Yeti Studio includes PreSonus Studio One Artist Blue Microphones Edition recording software, which gives you professional tools and intuitive workflows to help you start recording fast-just hit record and go. Capture your voice for podcasts, voice-over projects or audio for YouTube videos. Stack up multiple tracks of vocals and instruments and create fully produced songs. Edit your tracks on screen with ease, and even piece together multiple takes to sculpt the perfect vocal performance. Thanks to a 32-bit audio engine with superior sound quality, you'll be able to produce professional recordings with amazing speed and precision. Featuring professionally designed vocal style presets tailored for a wide range of genres and applications, iZotope Nectar Elements makes it easier than ever to enhance your voice and create rich, studio-quality vocal tracks. With easy-to-use controls, Nectar features 10 sophisticated vocal processors designed to add body and depth, control volume levels, fix pitch problems, reduce "ess" sounds, minimize room noise and more. There's no recording situation that can scare away Yeti. Perfect for recording vocals, musical instruments, podcasts, voiceovers, interviews, field recordings and more, Yeti is the world's most popular USB microphone for professional recording. Yeti's unique three-capsule array lets you record with 4 different patterns-directional for vocals and voice-overs, bidirectional for interviews, omnidirectional for the whole band, and stereo for separate left and right audio. With Yeti, you have the flexibility you need to take on any recording scenario. Looking for the perfect vocal recording setup? You've found it. With custom templates for voice-overs, podcasts and music, Yeti Studio provides everything you need to hit the ground running with professional-quality recordings. Featuring automatic track setup and dialed-in sound processing for rich vocals and instruments, Yeti Studio makes it faster and easier than ever to record professional projects. You'll be able to record single person speech, multi-person interviews, dialogue, instruments and more-with broadcast-quality results. Everything you need to record professional vocals. Order today!